The housing market can be extremely volatile. Since it’s in constant flux, homeowners should make smart decisions when choosing how to upgrade and increase its value. 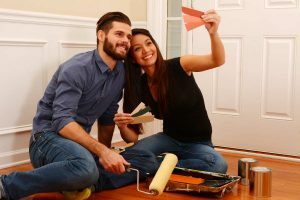 Whether you’re planning to sell in the near future or you simply want to increase your home’s curb appeal or functionality, these 6 improvements are relatively easy to implement and are a sure-fire way to increase the value of your property. Removing walls between a kitchen and dining area or breakfast area as well as between the kitchen and living room creates much more floor area to work with. Many modern kitchens have islands for separation and include storage space on both sides of the islands or a place to put bar stools for added dining places. This creates a cozy atmosphere for having a meal while allowing participants to view what is happening in the kitchen. The best part is that they will have comfortable seating and be staying out of the cook’s way. Adding paint in modern colors can really update your kitchen space. Replacing your current kitchen appliances with energy-efficient products is a great remodel project. As long as you are in your home, you can reap the benefits of lower electric bills because they use less energy, and many prospective homebuyers want these types of appliances in their home. If you would rather reinvent a room instead of adding a room to your home, examine all of the unused areas in your home. An attic space can be finished to make an additional bedroom, craft room or a game room. Kid’s playrooms can be created out of attic space with tall rafters to hang swings on. A basement is a very versatile area to finish and create a large extra living or family room. Basements support great areas for game rooms where they will be quieter than if they were on the same level as the living space. The acoustics in a basement also lend themselves for fantastic mixed media and home theaters. You could also finish a basement as an entire small living space for an aging relative. Homebuyers enjoy rooms that they can use for a multitude of purposes to suit their family lives. Replace older single pane windows with updated energy-efficient windows. You can recoup your cost quickly with the savings on your energy bills, which could get them to pay for themselves over time. In addition to the energy cost savings, you can also receive a green energy tax credit on your income tax statement. Some windows also have Energy Star rebates available that puts even more money in your pocket for this wise upgrade. There are so many variations of outdoor decks to use as dining and seating areas when the weather is nice. Complete outdoor kitchens are available with stoves, barbecue grills, refrigerators and bar areas for seating. Add built-in flowerpots with built-in seating for a more elegant appeal. A bistro set is always a good addition to a deck as are umbrellas for shade in the warm summer months. If your home has only one bathroom as many older homes do, consider adding a second bathroom. This definitely increases the value of your property and its appeal to a wider range of family sizes. If you are deciding to sell your home in the future but are unable to do a full addition, you could consider converting a closet into a half bath. Many homeowners don’t know it, but they could be wasting energy and money due to poor insulation throughout their house. A home inspector will also be sure to report it when a prospective buyer is considering the value. The best area to upgrade your insulation is in the attic where heat is lost through the ceiling in the winter and builds up in the summer, causing your cooling system to work harder to maintain an even temperature in your home. Other areas to upgrade insulation include recessed lighting, the basement and anywhere that a building material meets with a material of a different type such as in the air ducts. The addition of a programmable thermostat can greatly decrease your energy usage in addition to the insulation upgrades. Seal any cracks around the house and check around windows and doors for air leaks that require more insulation. Keep your home updated for your comfort or just to have basic maintenance on it to keep it in good order. Fix any roof leaks, wood that rots and rid your home of mold as soon as it occurs so you can make it a healthy home environment. Call us at Copper Creek Construction for major home renovations to protect your investment and increase the value of your home. Our knowledgeable staff can help you create the home of your dreams.